Sleigh bells ringing, beautiful lights glistening on pristine snow, mulled wine for your drinking and holiday music and singing...these are a few of the favorite things you will experience on this beautiful winter wonderland lesbian river cruise. 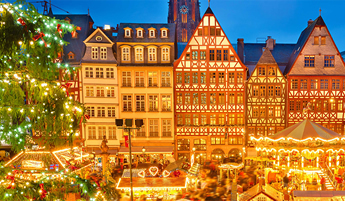 For the second time, we are providing an experience to take you to the delights of the winter season in Europe with the Christmas Markets in Germany and Prague. 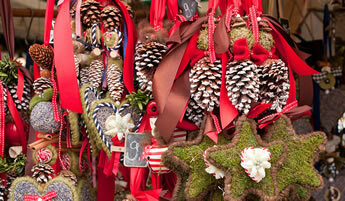 Experience the festive food and drinks, lights, markets, and decorated trees of the holiday season. Bring your jackets and mittens, and enjoy the festivities with the women of Olivia. On the banks of the Main River, behind medieval walls and towered gates, is the picturesque Bavarian village of Miltenberg. 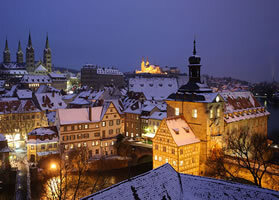 Take a step back in time during your guided walk of this cultural gem with half-timbered houses and narrow streets. Celebrate the season in charming Würzburg, known as the “Pearl of the Romantic Road,” and surrounded by sloping hills covered with vineyards. Visit the ornate Bishop’s Residenz—home to the largest ceiling fresco ever painted, then stroll through the Christmas markets while you sip Glühwein (hot mulled wine). 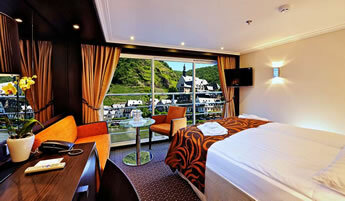 Disembark your ship and travel to Prague, Czech Republic—a 1,200-year-old city preserved in time. 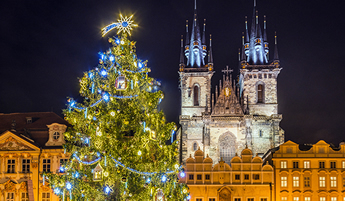 Stand in front of the medieval Astronomical Clock, walk across Charles Bridge, and browse the Christmas markets where rows of brightly decorated wooden huts sell Christmas tree ornaments, wooden toys, and Czech handicrafts. And you can’t miss the beautifully decorated tree in Old Town! The Avalon Visionary delivers an intimate setting, along with two full decks of suites featuring Wall-to-Wall Panoramic Windows that transform the living space into a unique Open-Air Balcony. With 200 square feet, Panorama Suites are more than 30% larger than the industry standard, giving you the rare opportunity to wake each morning to the enchanting scenery and fresh breezes. 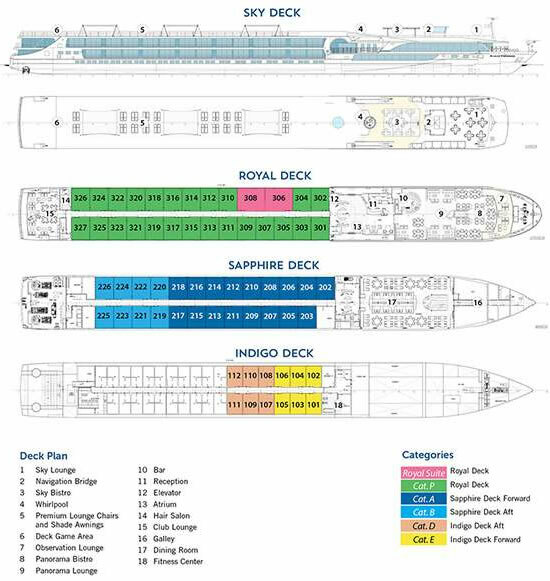 Onboard amenities include complimentary computer use in public areas and Wi-Fi access, a Fitness Center, and a spacious Sky Deck with premium lounge chairs, shade system, whirlpool, and the delightful Sky Bistro. Welcome to Frankfurt, Germany! 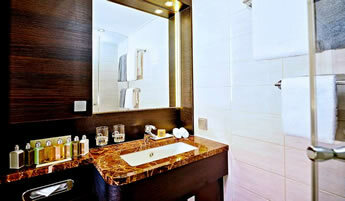 Settle into your hotel room, and enjoy a free day to rest, or take in the various Christmas Markets. 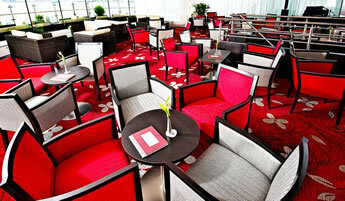 This afternoon, transfer from Frankfurt to Wiesbaden to board your ship (transfer included). 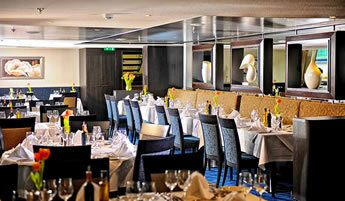 Meet your ship and Olivia crew at a welcome reception before dinner, as you set sail along the Main River. Tucked away behind medieval defensive walls and towered gates, the picturesque Bavarian village of Miltenberg is a cultural gem on the banks of the Main River. This morning’s guided walk will acquaint you with the town’s delightful Marktplatz (market square), which centers around a Renaissance-era fountain and features striking half-timbered buildings, cobblestone lanes, and one of the oldest inns in Germany, Haus zum Riesen (the giant’s house) and the gothic splendor of the Merchant Hall. 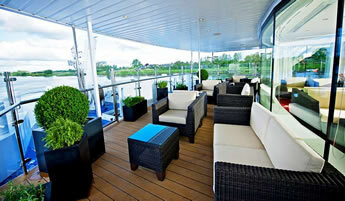 Later, continue your cruise on the Main River to Würzburg and enjoy a cookie-baking demonstration on board. 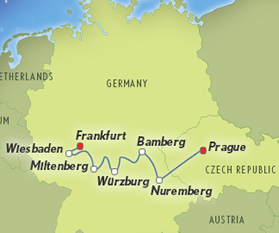 Known as the “Pearl of the Romantic Road,” Würzburg is surrounded by sloping hills covered with vineyards. The city makes an immediate impression with imposing Marienberg Fortress perched above town and the 15th-century Alte Mainbrücke (Old Main Bridge). On your guided sightseeing tour, visit the magnificent baroque Bishop’s Residenz, home to the largest ceiling fresco ever painted. 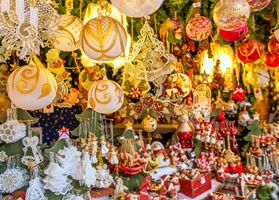 This afternoon you are free to explore the beautifully decorated streets on your own, visit the Christmas markets, or perhaps join an optional excursion to medieval Rothenburg, where you will have the opportunity to visit the Christmas Museum. Here, try a Schneeball (snowball), a local specialty not at all suitable for a diet! Learn everything about Christmas traditions during an onboard lecture this morning. In the afternoon, focus on medieval Bamberg, former residence of one of Germany’s most powerful imperial dynasties and today a UNESCO World Heritage Site. Your guided walking tour takes in its historic center, including the great 13thcentury Romanesque cathedral and the fascinating Altes Rathaus (Old Town Hall)—built on an island in the middle of the Regnitz River when the bishop refused to give the townspeople land for a town hall! This time of year, the town is decked out for Christmas. 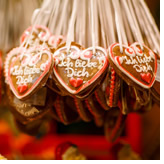 Enjoy the Christmas market, where, in addition to candles and decorations, you’ll find regional delicacies such as gingerbread and nut bread. Although 90% of Nuremberg’s Old Town suffered extensive damage during WWII, much of it has been restored to the glory it once knew as the unofficial capital of the Holy Roman Empire. Choose either a guided sightseeing tour and marvel at this thousand-year-old city’s medieval fortifications, gothic churches, and the Kaiserburg (Imperial Castle), or join a more specialized “Nuremberg Rally grounds” tour. 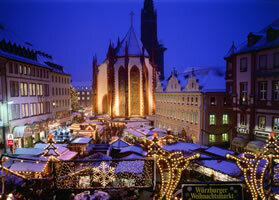 The Old Town is illuminated with festive lights and decorations, and the Christmas market is one of the most famous in the world. 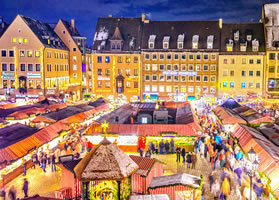 You’ll find dozens of stalls offering traditional wares, including Nuremberg Lebkuchen (spicy gingerbread), baked goods and sweets, Christmas decorations, ornaments, and more. Shuttle service to the ship will be at your disposal. 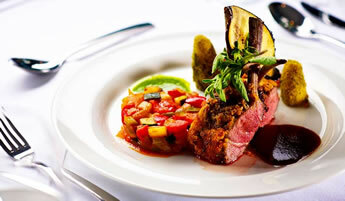 After breakfast today, travel with your Olivia staff by motor coach to Prague, the “Golden City.” We’ll stop for you to purchase a lunch snack and arrive in the afternoon for free time and dinner on your own. Prague is a 1,200-year-old city preserved in time. See its bestknown treasures, such as the Old Town’s Astronomical Clock, built in 1410 and once the envy of all of Europe; Hradcany Castle Grounds; St. Vitus Cathedral; and the Charles Bridge, the oldest bridge in Prague. 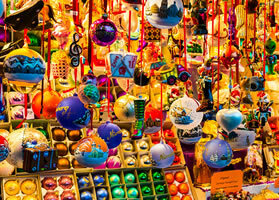 Browse the Christmas markets, where rows of brightly decorated wooden huts sell Christmas tree ornaments, wooden toys, and Czech handicrafts. 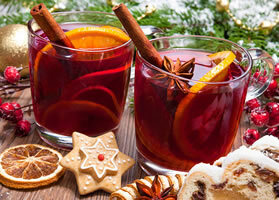 Get a little inner warmth with a cup of svarene vino (hot mulled wine) and a traditional hot sausage. The beautifully decorated tree in the Old Town is an impressive sight. 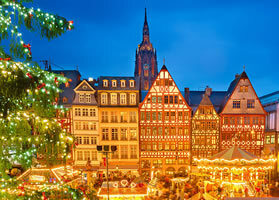 Afternoon will include some optional tours or enjoy more free-time on your own to explore the Old Town and Christmas Markets. 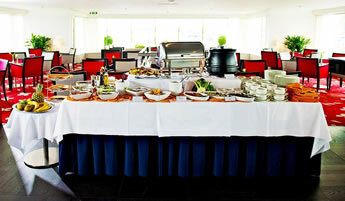 Your vacation ends after breakfast today. We will be offering a 1-night post stretcher in Prague, December 11-12, 2019. This will be offered no later than 9 months prior to the trip date. Early bird prices valid until June 6, 2019.